Three-piece rash guard swim set. Top: mock turtleneck; hearts graphic on front. Machine wash COLD / Line dry. Body: 83% Polyester / 17% Elastane. Color: Pink / Blue with White Polka Dots. Due to the many variations in monitors and browsers, color may appear different on different monitors. SKINZ UV Girls Rash guard Swim Top Size 7 UPF 50 . Great Condition is Pre-owned. Shipped with USPS First Class Package. 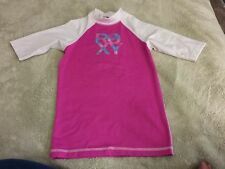 Zeroxposur Girls Swimshirt Size 8. This is a short snug fitting swim shirt. It is in great preowned condition. Please contact me with any questions. Thanks for looking. Sunscreen T top and Skirt Bottom. Gymboree 2 Piece Swimsuit. Girls size 8. Pink & Navy Hearts Adorable! 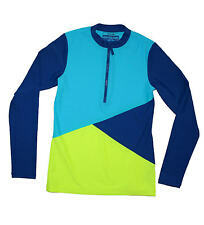 RASH GUARD SUN SHIRT. SWIM SHIRT. This is a Cat and Jack size 6-6x rash guard. this is in excellent condition. This shirt is short sleeved. You get 3 peices. Preowned so not perfect. Sun/swim resulted in fading. 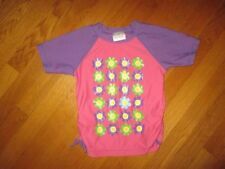 Girls ROXY Yellow Short Sleeve Rash Guard Size Small Roxy Logo, EUC!! Size 14. Condition is Pre-owned. Shipped with USPS First Class Package. Condition is Pre-owned. IMPORTANT INFORMATION . 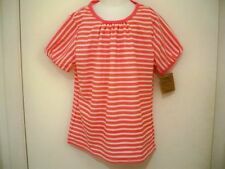 Lands End Girls Kids Rash Guard Swim Shirt Size 14 Coral Pink Stripe. Condition is Pre-owned. Shipped with USPS First Class Package. Three-piece rash guard swim set. Bottom: ruffle trim. Machine wash COLD / Line dry. Body: 83% Polyester / 17% Elastane. Due to the many variations in monitors and browsers, color may appear different on different monitors. SIZE: Youth 12 Years UV 50 Protection. -Long sleeves for maximum UV protection. CARE: machine wash cold, tumble dry low - very easy care. 21.5" long from shoulder top to bottom hem. CONDITION: good preowned condition with minor piling on lower sleeves. CWD KIDS Rash Guard. pit to pit: 16". Length (from shoulder in front): 20.5". 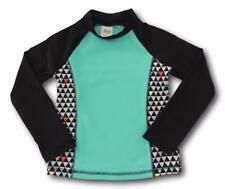 NEW Mudpie Mermaid rashguard shirt UPF50 Girls 5T. Condition is New with tags. Shipped with USPS First Class Package. The set includes a zippered rashguard and a swim bottom. I love that there are pockets for seashells or other treasures! The colors and designs on this set are very pretty. 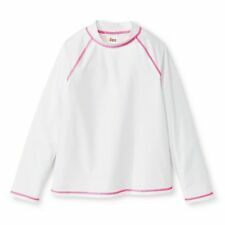 NWT Girls Vineyard Vines Shirt Sleeve Rashguard Size M 10-12. Condition is New with tags. Shipped with USPS First Class Package. Short Sleeve Rash Guard Swim Top. Lands End Kids. Hanna Andersson Floral Stripe Rash Guard Long Sleeve Swim Shirt Size 130 US 8. Condition is Pre-owned. Shipped with USPS First Class Package. UV Skinz UPF 50 Girl's 3 Pc. UPF 50 / Quick Dry Fabric / Rash Guard. Chlorine & Salt Water Resistant / Reversible Bucket Hat. Pink Abstract Floral. Girl's Size 12/18 Months. Pink / Blue & White Stripe / Bicycle Design. Some light snagging on front, otherwise good condition. Old Navy Girls Rashguard and Bikini Top. 82% nylon, 18% spandex rashguard and bikini top. Note - bottoms are not included. Color: Bondi Beach. The length of the top is 17". The width across the front of the chest is 11". Disney Minnie Mouse swim shirt Rash Guard Swimwear Size 3/4 years New! Minnie Mouse. RASH GUARD. SWIM SHIRT. Short sleeves. across: 11. Oneill Girls Surf Swim Rashguard Black Shirt Size 10. Condition is Pre-owned. Shipped with USPS First Class Package. Cat & Jack Girls' Long Sleeve Swim Like A Mermaid Rashguard - White - M. Shipped with USPS First Class Package. Great Swim Shirt in a lovely peach pink.